Getting ready for the summer and thinking ahead to the fall, I’m going to create a small garden. 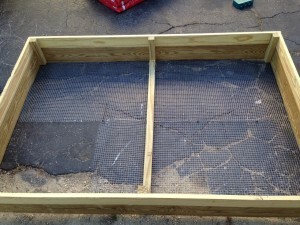 While I’ve had both large and small gardens, this time I’m aiming to get the most bang for my buck with a raised bed garden. A small raised bed garden measuring 6’ x 4’ should be enough to plant everything I need to keep fresh food on my table for the season. 4 cubic feet of garden soil with fertilizer. 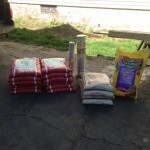 16 40lb bags of topsoil. 4 cubic feet of compost. Before we begin, I want to take a minute to bring to light one of the quotes that has stuck with me for many years, and authored by master carpenter Norm Abram. While growing up, my father and I enjoyed watching Norm Abram on the New Yankee Workshop and This Old House. 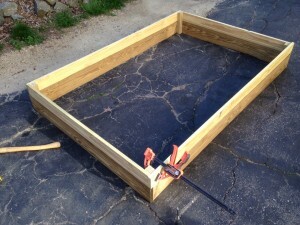 I have included a cut sheet that will work to build a garden box with overlapped (woven) corners at 4 x 6ft. You can pre-cut all your boards, and then move on to final assembly. Out of 1 x 6 x 12 cut two pieces both 70 ½ inches long. Out of 1 x 6 x 8 cut two pieces 48 inches long. Out of 1 x 4 x 8 cut two pieces 46 ½ inches long. Out of 1 x 4 x 8 cut one piece 72 inches long. Out of 1 x 4 x 8 cut another piece 72 inches long. Rip both 2 x 4’s in half ( a table saw can be helpful to do this). Out of these rips you’ll need 6 pieces at 9 ½ inches long. One rip cut to 43 ½ inches long. 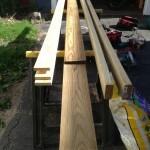 Then 5 pieces cut to 40 inches long with 45-degree bevels at the long points (these will be your fence posts). Now that you have completed all of your cuts, assembly will be a breeze. You’ll be using your 2 ½ inch structural screws to attach the walls of the box to the corner blocks. For aesthetics I kept the 1×6 lumber as the bottom course and the 1×4 as the top. The corners will form and alternating overlap, or weave, as illustrated in the photographs below. Please note: There is only one-way to assemble this based on the cut sheet provided. 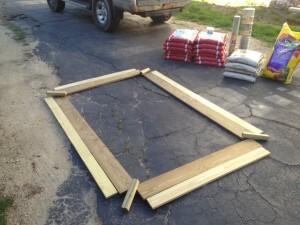 The short sides (4ft) of the 1×6 will overlap the long (6ft) side, and the 1 x 4 will do the opposite. Begin assembling the sides of the box, using 2 screws in each board/corner, to attach the corner boards. 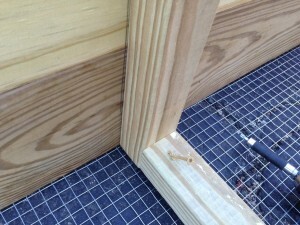 The corner boards should be even with the top of the sidewalls when finished. Repeat this until all 4 sides are assembled. After the basic box is assembled you’ll need to add a cross support to prevent the sides from bowing out over time. Hooking your tape on the outside of the box and run it down the long side; make a mark at 35 ¼ inches. Using your speed square (as pictured below) draw a square line down the inside of the box. Mark the far side of the line with an “x”. Repeat on the opposite side “pulling your measurement” from the same edge of the box. Attach the two remaining 9 ½ blocks (covering your “X’s”) to the long walls of the box.Attach the 43 ½ inch piece of your ripped 2 x 4 so it fits in between the two 9 ½ blocks you added. 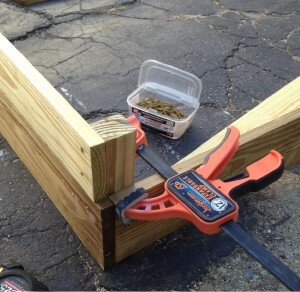 This will add structure to your garden and prevent bowing of the sides. Your box should be square. 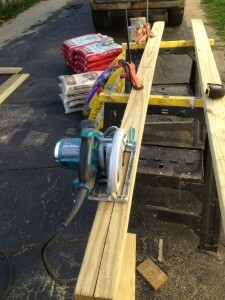 If you measure outside corner to outside corner, (diagonally) you should roughly 86 ½ inches. As long as both diagonals are the same, you have created a perfectly square box. At this point, you can flip over the box and add the hardware cloth. This will keep critters from attacking your garden from below; in particular, moles and voles. I simply used a few washer headed screws I had kicking around. However, anything that holds the screen in place will work fine. Now it is time to install your garden. It’s definitely worth the extra effort to square and level the box. Not only will it be more visually appealing, it will also shed rain more evenly. 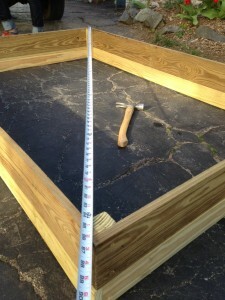 Use a 2 ft level on the short sides and a 6ft on the long sides to get a rough idea of the amount of leveling needed. 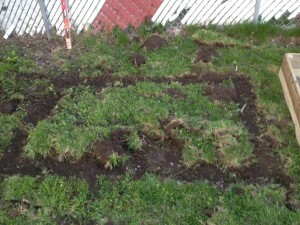 After the initial check, mark out the area around the raised bed with a shovel, remove the box, and begin to dig. Skim off all the grass so there will be no risk of it growing up through the garden. Dig the high point down until the box is level. 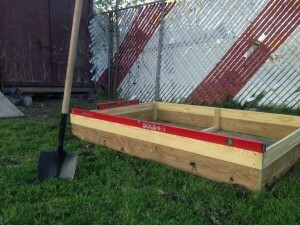 Once the box is level on all four sides, begin to fill it with a mix of compost, top soil, and garden soil (with fertilizer). Mix the different layers of soil thoroughly, and before you know it you’ll be planting! Congratulations, your garden is complete! 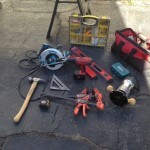 Next post: Latest Tool Deals!